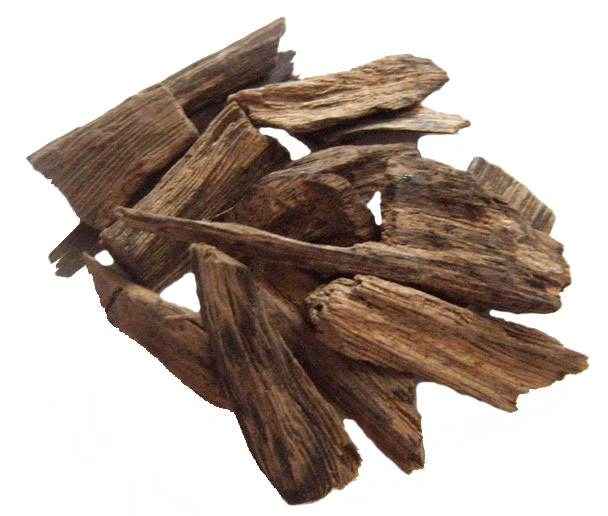 Agarwood is the resinous wood of Aquilaria and Gyrinops that have been infected with Phaeoacremonium parasitica mold. Both the wood and oil distilled from it are highly prized because of their scent, medicinal, and magical properties. Agarwood tea is said to cure many digestive and organ ailments including cirrhosis and fatty liver. It can also be a laxative for constipation caused by stress. It aids in meditation and visionary work. Its scent is also aphrodisiac, so it is used in many perfumes and oils for attraction. In the Arab world, attar (a type of distilled oil) made from it is extremely popular. As incense, it is a good general offering, as all known deities who “eat” smoke eat agarwood. Those who prefer steam or sprays, such as storm and some water spirits, prefer a concoction made with the attar or an infusion. In spellwork, a piece of quality agarwood can help one to be victorious in battles, political, or legal struggles. A charm bag with this makes an excellent helper for a lawyer, activist, or someone enduring an intense competition. It can also be helpful as a glamour aid for someone who wishes to appear to have higher status or authority. When you are doing work that requires deep trance, it is very helpful for this as well. It helps you to stay on point if you’re chanting, and if you seidh or dance with the scent burning or evaporating from your body, it’s like you don’t even feel your weight. In love spells, it is used to enhance the respect factor. It encourages the target to take the sender seriously. In capnomancy (smoke reading), agarwood is a teacher of struggle, war, pain, and triumph over adversity. It can tell you if you are likely to win or overcome, and help you to make optimal use of your abilities and resources. agar, agarwood, incense, jinko, oodh, oud, oudh, resinous woods, wood. Bookmark.